When we see a mosque spire rising up from a small village, in this case, a village on the west bank of the Nile near Luxor, (notice all the unfinished buildings) that spire tells us a lot about the village. 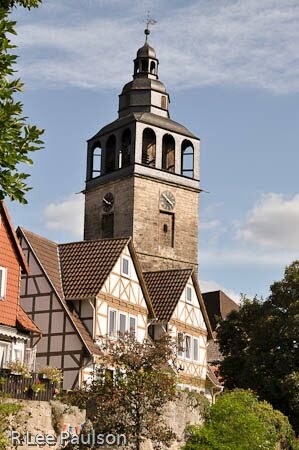 When we see a steeple like this poking up over a different village, like this one in Bad Zooden Allendorf, Germany, that steeple also tells us a lot about this village. It's a different story than the mosque spire, certainly. But it tells us a story none the less. There are many layers and nuances to each of these symbols. It's not as simple as saying, church or mosque. We can also fairly accurately surmise what type of religious services take place inside each building attached the the steeple or mosque spire. We know there are variations some subtle, some not, in each of the various Muslim and Christian houses of worship. If we are conversant in religion we can make a fairly accurate educated guess about the customs we might find in each of the two villages. In short, each of those simple symbols gives us a wealth of information, some conscious, but a lot of it not. What each of those symbols does is reach deeply inside of us, grab a deep level of knowing and instantly communicate that information to us in a form that is mostly beyond words. Similarly, when we see a crucifix, that symbol also has attached to it many different layers of meaning. This one is more abstract, in that we don't see the actual cross, but in spite of that omission, the image is still instantly recognizable to most of us here in the states or Europe or South America. 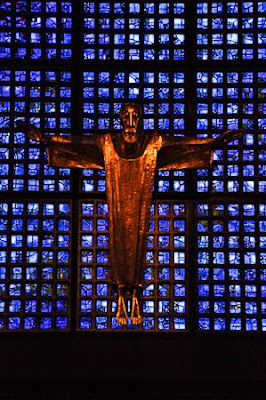 This was taken in the new church in Berlin, the one built to replace to the bombed out shell which has been made into a war shrine next door. This man on a cross represents a complete story line to us. Most of us know the story inside and out. The story has been part of our awareness for as long as we can remember. We have many different emotions tied to that story. We may have personal experience praying to and receiving guidance from what this symbol represents to us. And, many of us never seem to tire of celebrating certain yearly festivals associated with the man hanging on this symbol. We celebrate those festivals because the story represented by this symbol has a personal, deeply emotional connection to us. 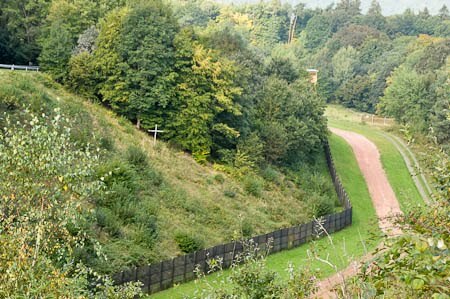 when we see one on a hillside like this, we know instantly what happened there. And for many of us, that simple symbol touches emotions deep inside us. The emotions it touches are different, of course, depending upon who we are. For me it was sadness, because I only knew that someone died on that spot. For the man standing next to me, who was a personal friend of the individual who died, and knew the circumstances of the death, the emotions ran much deeper. 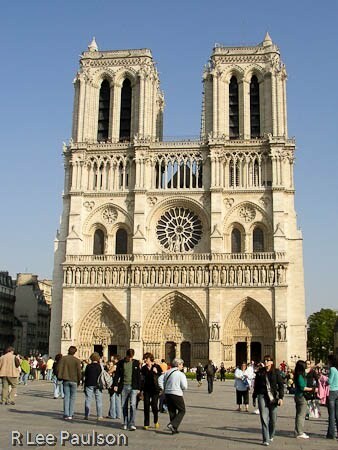 When we see this photo or actually stand in front of the Notre Dame Cathedral in Paris, we instantly find ourselves connected with a similar but different story. Inside us, we get the history, we know the Christian denomination which worships in this place. Many of us have a very good idea about what kind of religious services are performed inside. But, there is much more which registers inside us, the magnitude of the effort required to build this place, 200 years more or less. And the cost. And what that place has represented to those who have worshiped there over the years. 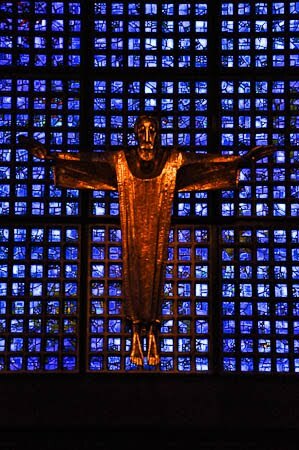 And also, for others who are aware of history, the struggles between church and state in France have become part of this symbol. If, say 4,000 years from now, archaeologists began rooting around the ruins of some these places, they might draw some interesting conclusions. They might notice the sculpture of the dead guy hanging from the cross in the front. In this one, if they found the stations of the cross, and then happened down into the basement they would find all sorts of dead people buried there. 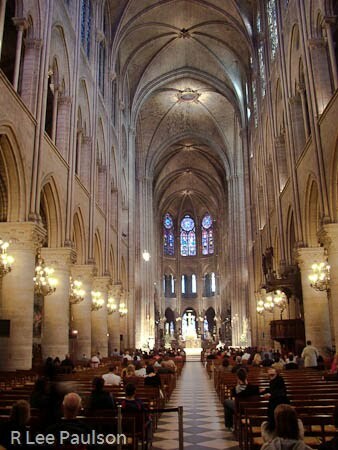 Or, in Westminster Abbey, where so many dead people are buried beneath the floor of the sanctuary, many of them have been buried upright to conserve space, those archaeologists might come to the logical conclusion that the ancient folks who worshiped in places like this were part of some sort of strange death cult. Which is odd, because what the folks who worshiped here were really celebrating was eternal life and redemption. 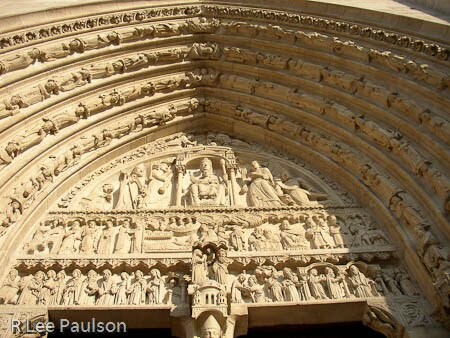 In Notre Dame of Paris, this temple, if you will, all sorts of sculptures can be found both on the outside and inside. To a knowledgeable person, each of these sculptures means something. They each tell a story. And if one is privy to the symbolism, one can read the stories in the same way that others of us read a book. The problem is, the vast majority of folks who worship in places such as this are unaware of just what the symbols were intended by the builders to mean. So, effectively, there is the story of the guy hanging on the cross, which most everyone knows. And then there are other, more subtle aspects of the religion known only to a few. In some ways, it's like a code. If you know the code, you can read the stories. If you don't know the code, well, the best you can do is make something up that fits the picture based upon your own understanding and background. In most cases, the exact meaning intended by those who made the sculptures will always be a mystery to you. 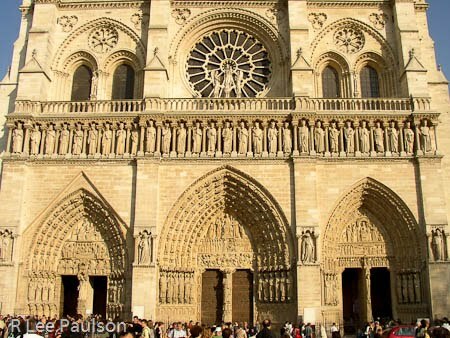 Even though this is my photo, taken from the outside of Notre Dame Paris, I Googled this image and found two or three in the Google picture section. In each case, the individuals who took similar photos to this were clueless as to the original meaning. One guy suggested that it's a tale admonishing folks to never lose their heads over a bunch of women. A better educated guess based upon historical fact is that the headless man is St Nicaise, a tenth century bishop of Rheims, who ministered to small pox victims but was beheaded as he stood praying in front of invading Huns. The bishop was reportedly seen carrying his head back into the cathedral and only fell dead when he reached the alter. 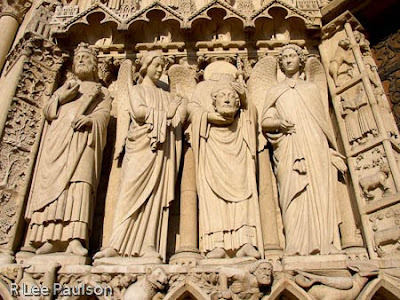 John Anthony West and other knowledgeable scholars say that St Nicaise, holding his head in this sculpture, was placed outside this temple intending to convey multiple levels of symbolism. One acknowledges his martyrdom. But at a deeper level the sculpture symbolizes the conquest of self-will, the so-called battle that each of us must fight within ourselves between the forces of light and dark. A battle, which we know by his actions, that St Nicaise clearly won. Which is interesting from the perspective that this theme is very similar to the battle of Kadesh, a battle we have seen on the outside of a different temple, except that temple was constructed some 2,500 some odd years before this one. In each case what we have is a historical story taken to a deeper symbolic level and used to illustrate subtle tenants of the faith. Now, as we revisit the battle of Kadesh, knowing what we do about the degree of symbolic subtly employed by the ancient Egyptians, the interpretation of the egotistical pharaoh seems rooted more in contemporary fantasy than ancient intention. As West says, "the purpose of this complex relief is the depiction of the battle between the forces of light and darkness (within ourselves). Having vanquished the enemy (within) the king can enter the Temple; to enter the Temple, all obstacles in the external world must be overcome. 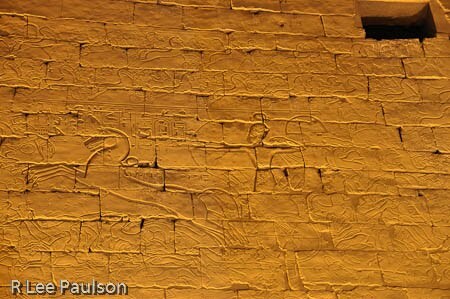 This is why the battle scenes are all on the exterior of the Temple Walls." Odd, isn't it? How as we dig deeper into the symbolism of the ancients we find similar truths being taught then, as now? This small example turned out to be only the beginning. 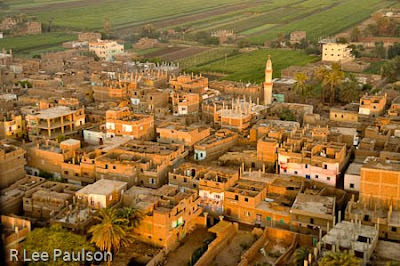 I came to Egypt with my ears ringing with what I had been taught about ancient Egypt. That they were obsessed with death. What I found was just the opposite. Like us, they were really celebrating eternal life and redemption. More on that next time. Continue on to Post 18: Abydos by clicking here.